Play Online Casino games and Online Casino Slot games at Topboss Casinos. This site features the Top Online Casinos. Slot Machines are in abundance including Bonus Feature Slots, Progressive Slots and Classic Slots. We also have a page packed full of Free Casino Images. Caribbean Stud is a casino card game, which features a negative EV of about 5.3% on the ante bets players need to place in order to participate in the game. As such, Caribbean Stud cannot be beaten in the long run, but the variance can still yield nice short-term winnings for the players. While Caribbean Stud has some common elements with the well-known 7 Card Stud variant, it doesn't involve bluffing and can therefore not be cataloged as a game of skill. In Caribbean Stud, players will play against the house and not against each other. To begin, everyone needs to place an ante bet. That gives the player the right to be dealt in. After all antes were placed, the dealer announces "no more bets". Anyone who's looking to place a bet after that will have to wait for the next round to play. There's a special ante box on the table, and the chips need to be in it when the dealer makes the call. The dealer then deals everyone 5 cards face down. Players cannot take a look at these cards, they'll have to wait till the dealer turns one of his 5 cards face-up and pushes their face down cards towards them. Players can then take a look at their hand, but they are not allowed to look at the hands of their neighbors, neither to discuss their hands with other players. If one player breaches this rule and communicates with fellow players, all the wagers will be forfeited and the hand will be declared a dead one. After they take a look at their hands, players have to make the decision to play or to fold. If he decides to fold, the player loses his original ante. If he decides to play, he needs to place a bet equaling two times the ante into the bet-box on the table. The dealer then reveals his hand, he will only play Ace/King or higher, if he does not qualify, all bets shall be considered void, and players receive even money on their antes, but not on their bets. If a player is dealt an incorrect number of cards, his hand shall be considered dead, but the round will continue without him. Players need to keep all their cards in full view of the dealer at all times. After their hands were examined by the dealer, they will no longer be allowed to touch their cards. No hole cards can be revealed before the dealer declares "no more bets". If someone happens to turn a hole-card over, all hands shall be considered dead. 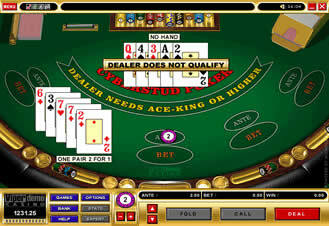 If the player manages to show a hand which is better than that of the dealer, he wins. He gets even money on his ante, and his bet will be matched according to how good a poker hand it is. A pair pays him even money, two pairs give him 2-1, a set gives him 3-1 and so on. A Royal Flush awards the player a 100-1 payout. If - at showdown, the dealer wins, he will collect both the ante and the player's bet. Progressive payouts are also possible at the Caribbean Stud tables. Players need to make certain that they do indeed insert their $1 progressive wager into the assigned slot and that the indicator light is on. Upon hitting a straight flush, the player will usually get 10% of the progressive jackpot. If he hits a Royal Flush, the entire jackpot is his. Caribbean Stud does have an optimal strategy which reduces the house edge to 5.2% , but it is extremely cumbersome, and there's not really any practical value in it. Playing close to optimal house edge can be achieved by raising hands containing many high cards.